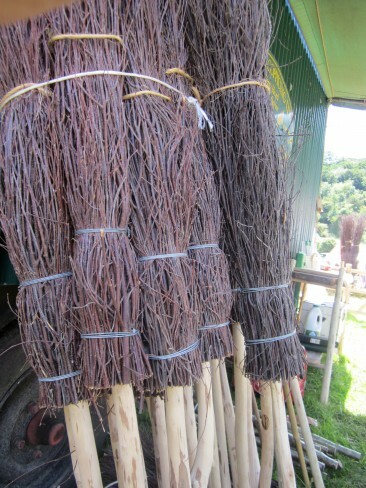 Besom brooms are normally made from birch twigs and the handles from hazel rods. They are favoured by some gardeners for specific jobs, sweeping leafs of patios, moss from timber decking or as the broom head wears down and becomes more stiff it can be used for clearing moss or worm casts from lawns or dog hair from rugs. Many people like its natural charm and look well as an ornament in a conservatory or kitchen. Coppice workers get busy around Halloween and will supply smaller brooms for children during this time.